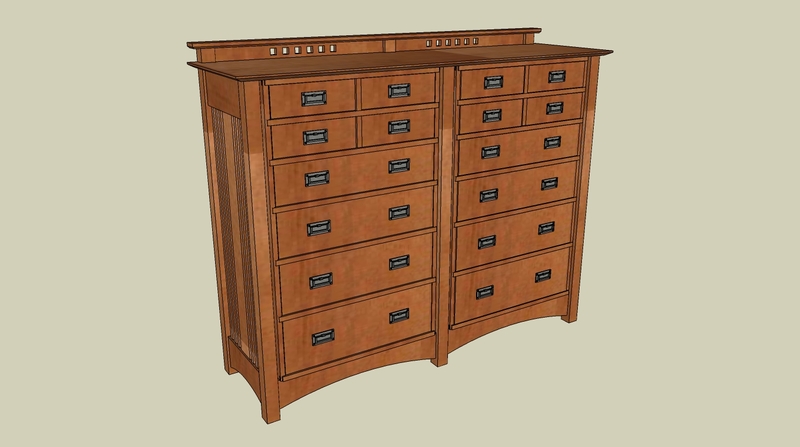 ﻿I was having a hard time coming up with a new design for a dresser for our master bedroom. I wanted it to match well with the arts and crafts bed and matching nightstands that I made a couple of years ago but I didn't want to do a straight copy of a plan. Finally inspiration struck while visiting the Thos. Moser showroom in Freeport, Maine. I stumbled across their American Bungalow tall dresser and immediately fell in love with it. That one has a very traditional shaker style rectangular cherry cabinet suspended inside a very arts and crafts looking structure. Very Niiiice (in Borat speak). As much as I admire Mr. Moser's designs I have no intention of copying it outright and unfortunately I cannot afford any of his furniture. So as with most furniture, I borrowed a little inspiration from Mr. Moser as well as from an exhaustive search on google images and came up with the basic parameters for my own design. I was looking for a large dresser that would stand on the wall opposite the foot of our bed than I can put our TV on top of. I also wanted lots of drawers and for it to be a double dresser so my wife and I would each have a side. (in theory at least, in practice she might let me have a drawer or two!) and of course it had to draw from some of the stylistic elements of our bed and nightstands. In the photos above, you can see where I'm at with the design. There will be two identical flatsawn red oak cases dovetailed together at the corners. The drawer web frames will be dovetailed in at the sides and back with the drawer runners mortised and tenoned into the front and back "blades" Only the front will be glued and the back will be loose to allow for expansion of the case sides. I'll likely make the runners and rear blade out of ash since it's relatively inexpensive in these parts. The two cases will bear on front and back stretchers that will be tenoned into an outer frame that has the same vertical spindles as our bed. I've extended the rear posts up through the top and added a crest rail across the top. The holes through the crest rail are decorative but they also allow you to pass plugs through for the electronics that will inevitably be placed on top of this dressser. The back of the cases will likely be tongue and groove pine boards. The drawers will have half blind dovetails in the front and through dovetails in the back and have a solid ash bottom. 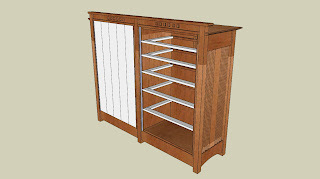 I may consider putting in a center runner in the larger bottom drawers to cut down the span of the drawer bottoms. I love using skecthup for this stuff but I'm still a bit worried about the proportions. In particular I'm wondering if the 2" square legs are big enough. I should really do a full scale mock up of this thing but I'm not sure what material to use for the mock up. Perhaps rigid insulation? Another issue with the legs is that I know I can buy riftsawn 8/4 stock from my local supplier which will likely only yield a 1 3/4" square leg. To get the 2" square I'll likely glue up the leg pieces face to face and be diligent in ensuring that the exposed edges are riftsawn so the seams don't show as much. I could try the Gustav Stickley Quadrilinear post method but those lock miter bits scare me in the sense that I've heard they are tough to set up properly to get good results.